Shuvee was an American Thoroughbred Champion Hall of Fame racehorse who was the second filly to ever win the U.S. Filly Triple Crown. A daughter of Hall of Famer Nashua, a descendant of Nearco, Shuvee's damsire was another Hall of Famer Hill Prince who in turn was a son of the important sire Princequillo. In addition to winning the Triple Tiara, in 1970 Shuvee became the only filly to ever defeat colts in the grueling two-mile-long Jockey Club Gold Cup. Just to demonstrate how good she was, future Hall of Fame jockey Ron Turcotte, and 1973 Triple Crown winner aboard Secretariat, guided her to a seven-length repeat victory in 1971. After winning her second straight Eclipse Award for Outstanding Older Female Horse, Shuvee retired at the end of the 1971 racing season having established a career earnings record for fillies. 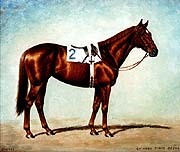 As a broodmare, she had only modest success. In 1975, Shuvee was inducted into the National Museum of Racing and Hall of Fame where her portrait by equine artist Richard Stone Reeves can been seen in the Museum's collection. On its creation in 1977, she was voted into the Aiken Thoroughbred Racing Hall of Fame and Museum.